Our 2013 Trivia Contest featured questions about athletics at Michigan State University. Twenty-eight people entered and two people answered all eight questions correctly. We will be contacting the winners soon. The staff at the University Archives & Historical Collections would like to thank everyone for playing and we hope that you will participate in our contest again next year! 1. What was the first year the Michigan State football team played in the Big Ten Conference? Michigan State was officially admitted into the Big Ten Conference in 1949. Since the football schedules are set years in advance, the Spartans had to wait until 1953 to play their first Big Ten football game. 2. Which Michigan State boxer was undefeated in every college bout he fought? Boxer Chuck Davey went undefeated in every college bout he fought, was 3 times voted the NCAA’s outstanding boxer, and fought at the 1948 Olympics. The other three boxers listed as choices in the contest also had notable accomplishments. John Horne won three consecutive NCAA titles between 1958 and 1960, was a two-time All-American, and competed without a regular coach, program or sparring partner. Herb Odom (1952-1955) was back-to-back NCAA Champion at 147 pounds (1954-1955), led MSU to a 1955 team National Championship, was a two-time All-American (1954-1955), and compiled a 29-5-2 career record. Choken Maekawa of Hawaii won the 1956 NCAA individual title and was awarded the John S. LaRowe Trophy (outstanding boxer of the tournament). He was chosen for the 1956 U.S. Olympic team, but did not make weight at the official weigh-in and was disqualified from competition. Note: According to the U.S. Social Security Death Index, his last name was spelled Maekawa. In some sources, his last name is spelled Mackawa, hence the misspelling in the trivia contest. 3. What year did women form their first basketball team at Michigan State? The first women’s basketball team at Michigan State played against teams such as Lansing High School, the teachers from the Flint School for the Deaf, and the Michigan State Normal School (now known as Eastern Michigan University). 4. Prior to being “The Spartans,” what was Michigan State’s nickname? Being an agricultural school, Michigan State’s original nickname was the Aggies. After the 1925 name change from Michigan Agricultural College to Michigan State College of Agriculture and Applied Science, a contest was held to pick a new nickname. Dissatisfied with the winning choice of “Staters,” LSJ sports writer George S. Alderton looked through the other entries and picked “Spartans.” Unfortunately, it is unknown who submitted the entry. 5. 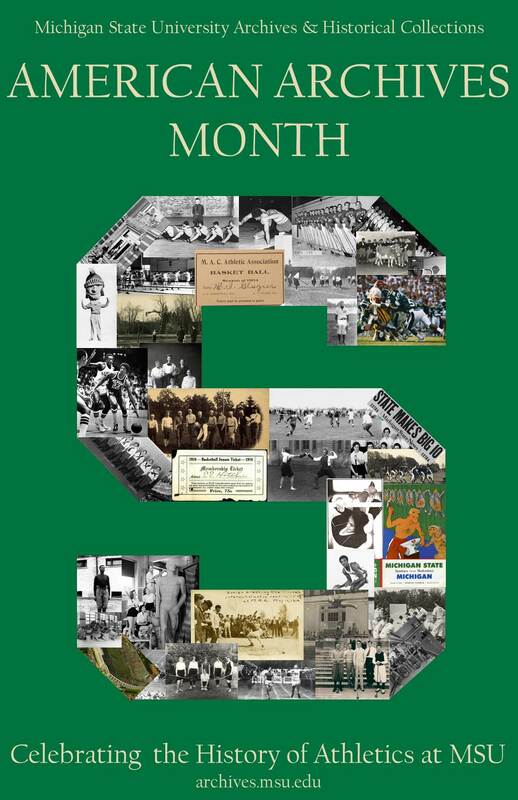 What year did Michigan State’s first African American athlete, Gideon Smith, begin playing? 6. 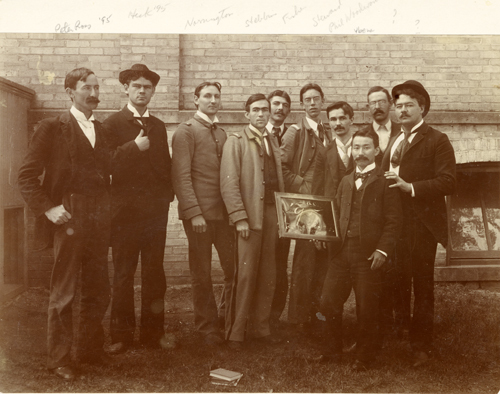 In 1895 Shoichi Yabina was the first Michigan State student to participate in which sport? Shoichi Yabina (class of 1895) participated in the first fencing match at the 1895 MIAA field day. He defeated his opponent, Mr. Swift, from the Michigan State Normal School (EMU). The sport was revived in 1924 by French professor Omar M. Lebel, and Joseph Waffa, an Egyptian student. Note: His last name may have been spelled Yebina. 7. In May 1910 Michigan State faculty approved regulations for student athletes. Which of these were included? The faculty regulations stated that students must compete under their own names, could not be compensated for playing and freshmen were not allowed to play intercollegiate sports. Additionally, student’s eligibility was limited to three years, the football team could not practice until the school year started, they could only play teams from other colleges, and the number of games played was limited (9 for football, 16 for baseball and basketball). 8. What was the name of the first baseball club formed at Michigan State in 1865? The Stars baseball club played against teams in the surrounding community. Dr. King can be seen here in the MSU Auditorium. Ticket sales from the speech were given to the STEP program. Myrtle Craig, in the middle-left, was the first African American student to attend MSU. 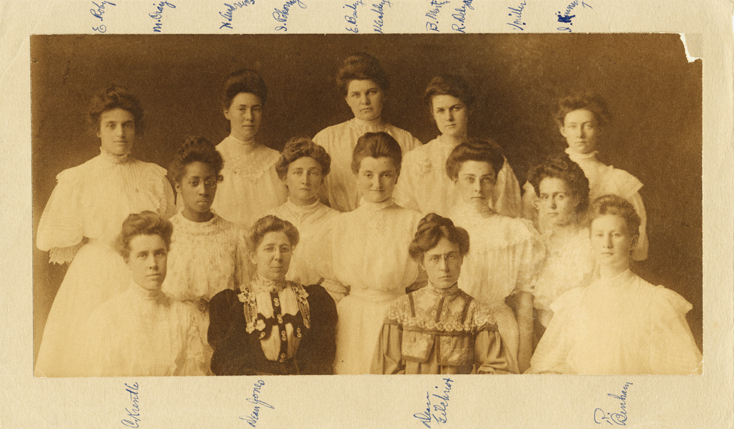 She is seen here with her graduating class of 1907.
have made their mark on MSU history, especially with the upcoming holiday for the Reverend Doctor Martin Luther King, Jr. Dr. King’s contributions to the Civil Rights Movement cannot be understated, in addition to the thousands of others whose valiant efforts to end discriminatory practices have brought the US to where it is today. Four years before his death, Dr. King brought such issues to life when he visited MSU in person to speak at the Auditorium. The purpose of his visit was not only to discuss policies for desegregation in the south, but also to support the formation of a new and entirely unique student-run organization by the name of STEP. G. Scott Romney, former member of the MSU Board of Trustees and brother to Governor Mitt Romney, was an MSU student at the time of King’s speech, and in the Board meeting minutes years later he recalls, “Dr. 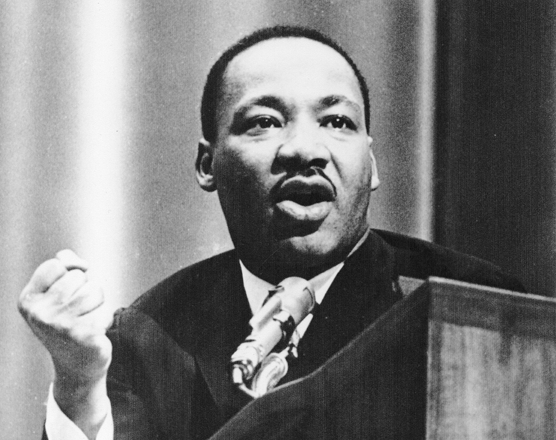 King as being a very humble and respectful person, but one who had great power.” More information about the particulars of the 1965 visit can be found here, in the “Martin Luther King, Jr. Visits MSU” exhibit on the Archives’ website, including photographs and sound bites from his speech while on campus. Ernest Green can be seen here alongside the rest of the honorary Blue Key members in this photograph from the 1962 Wolverine yearbook. 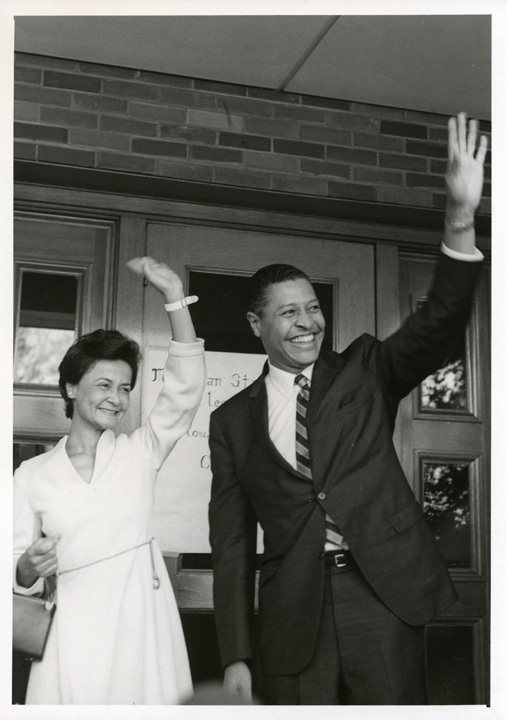 Clifton and Dolores Wharton can be seen here waving as they arrive on campus in 1969. This photograph from 1979 shows Earvin Magic Johnson posing with his Sporting News Trophy. Rock Nine, was one such student. Green was famously the first African American to graduate in 1957 from Central High School in Little Rock, Arkansas after months of harassment and debate. Upon his graduation, he received an anonymous full-ride scholarship (rumored to be from John Hannah, himself! ), and went on to complete his undergraduate degree in Social Sciences at MSU. He is known to have said that his time spent at his alma mater transformed his life and taught him skills critical for his later success. 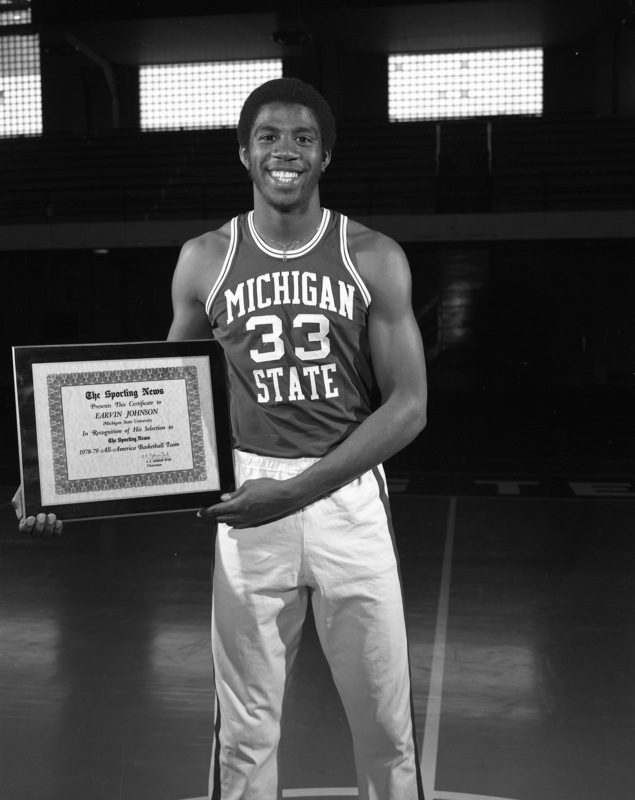 Earvin “Magic” Johnson is another famous face that left an unrivaled legacy at MSU. Johnson is celebrated not only for his stellar basketball performances, but he has also gained national recognition for his efforts to raise awareness about HIV/AIDS through the creation of the Magic Johnson Foundation. There could be an entry for every day of February concerning the vast array of contributions the African American community has made to MSU. From Myrtle Craig breaking not only racial and gender stereotypes, to Clifton Wharton, first black president of a major university – the list is endless, and a month could never encompass the accomplishments of each individual. As Black History Month is coming to a close, I thought it would be interesting to highlight some of the first African American students at MSU that broke barriers changing the way the University and its students perceived the presence of African American students on campus. The following three individuals were among the first black students to be a part of the Michigan State community. Myrtle Craig arrived at MAC after graduating from a small school in Missouri. Craig was not only a woman enrolling at MAC, but was the first African American student to attend the university. She faced many obstacles during her time here. Not only was the Women’s Building too expensive for her, but she was not allowed to live there because of her race. When she first began at MAC, she lived with Addison Brown, the secretary to the State Board of Agriculture and cooked as a way to pay off her rent. She then moved in with Chance Newman, an Assistant Professor of Drawing and worked as a sales clerk, in a clothing store, and as a waitress to make ends meet. On May 31, 1907 she graduated and received her diploma from United States President Theodore Roosevelt. For the next forty years she devoted her life to teaching African American students. Gideon E. Smith was also a very influential figure in the history of Black individuals at Michigan State. Starring at left tackle for the Aggies during the 1913, 1914, and 1915 seasons, Smith was the first African American to play football at MAC. He was one of the most influential players on the team and contributed a lot towards winning seasons of football. 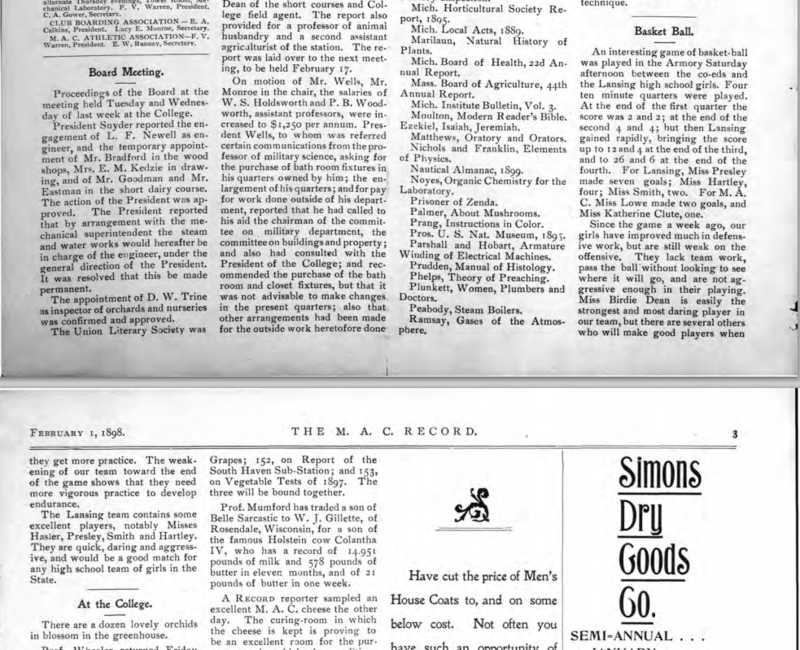 However, like all other African American students before 1930, Smith’s name and picture were not included in the men’s societies’ pages in the yearbook. Despite his involvement in sports and other societies on campus, there was no visual record of Smith due to the way that African American’s were perceived in society. Despite his struggles to gain credibility among the college community, Smith graduated with a BS in Agriculture in 1916. 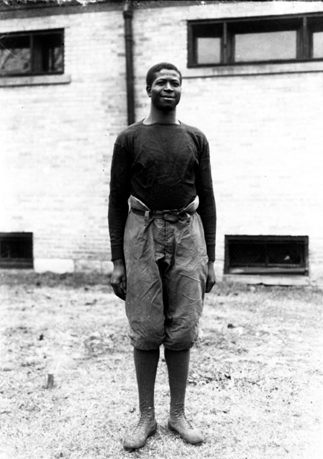 He went on to become one of the first professional football players and he served in the military during World War I. He then dedicated the rest of his life to teaching and coaching African American youth. Everett C. Yates, the first African American to play in the college cadet band and orchestra, also paved the way for future Black students here at Michigan State. Yates was a percussionist in both of these organizations that provided music for the parades and dances at that took place on campus. He graduated with fellow classmate Gideon Smith in 1916 receiving a BS in Horticulture. Even though the two men graduated together, it was not until recently that Yates’ legacy was recognized. After graduating from MAC, Yates went on to become a very successful teacher, teaching music in schools around the country. These three individuals, Myrtle Craig, Gideon Smith, and Everett Yates, were some of the first African American students to break color barriers on campus. Through their persistence in their respective and highly visible activities, they paved the way for future Black students at Michigan State.